I think we can all learn a thing or two in this post. Enjoy! In the summer, you try your best to provide optimum care for your hair. But as the season transitions to autumn, you need to change up your hair care routine as well. The best start for this is to use products designed for use in the autumn so your hair does not get confused with the changes. Investing in these products make hair care easier because they are formulated with the weather conditions of fall in mind. Fun in the sun can cost you… big time. From the chlorinated pools to the sea water and exposure to UV rays, the cause of damage piles up. Use a clarifying shampoo to get rid of remnants of damage with its cleansing formula. You can also choose a repairing conditioner to further nourish your strands and help it recover from any signs of damage. Most of these shampoos and conditioners are formulated with natural plant extracts to tap into the natural healing powers of these plants. In addition, you do not have to worry about causing more damage to your hair. Aside from the sun and salt causing your hair to get dry, autumn’s cool weather can also make your hair prone to dry scalp and flaking. Hence, amp up your hair’s moisture level by using a moisturising shampoo or treatment. When shopping for hair care products, be on the lookout for hydrating ingredients such as coconut or jojoba oil. A deep conditioning treatment is extremely important for your hair in preparation for fall. It doubles the benefits of a traditional rinse-through conditioner because the formula seeps deeper into the hair cuticle. For extremely sun-damaged hair, deep condition at least twice a week. The scalp might be typically overlooked as part of a woman’s hair care regimen. However, healthy scalp is the foundation of having healthy hair. Make it a point to treat and protect your scalp especially since it is most vulnerable during colder months. You can make your own homemade hair masque recipe or purchase ready to use products. Whichever you prefer, choose ones with nourishing qualities and ingredients so your hair looks good and is healthy from within. This treatment product is recommended for women with brittle hair and split ends problem. Once you have taken the measure to nourish and moisturise your strands, use sealing oil or serum. This will ensure that any moisture you have introduced to your hair strands are locked in there. It is easy for moisture to escape into the air during the cold weather, which is why static and frizz are common problems during fall. Which products do you use to nourish your hair for autumn? Abby is a writer and social media marketing manager for My Hair Care. 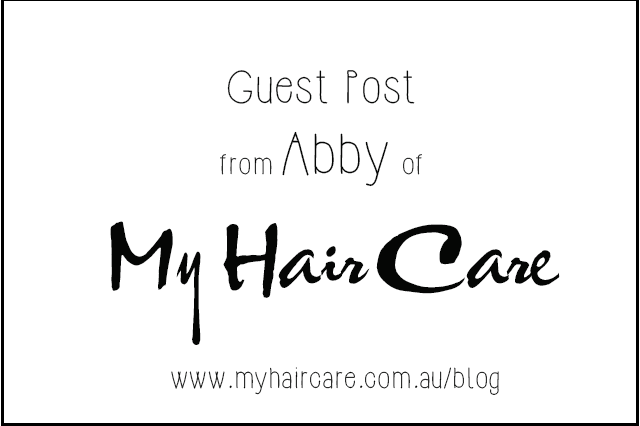 If you need an additional resource for hair care, styling and beauty, head on over to their blog at http://www.myhaircare.com.au/blog. Thank you Abby for guesting. I am sure all my readers appreciate the information you've shared, I sure did! For more hair care articles please don't forget to visit MyHairCare.